This product requires the base game Trainz Simulator 2012. British Rail devised the Class 14 locomotives to replace the seemingly indispensable ex-GWR Pannier Tanks which busily performed shunting duties, yard transfers and short haul freight services on Western Region tracks. The Class 14s were designed with an axle load suitable for light line working, and were powered by a Paxman 6-cylinder Ventura engine rated at 650 hp, Voith hydraulic transmission and Hunslet triple reduction and reverse gear box. Initially these locomotives appeared to have a busy future, however, the traffic they were built for was quickly disappearing and many were stored after only 2 years in service. Many units were purchased for work on private railways such as those operated by the National Coal Board and British Steel Corporation, where they were kept engaged until the 1980's. IHH's popular and superbly represented Class 14 in BR and NCB lliveries. Produced in conjunction with Iron Horse House, the BR Class 14 add-on pack is sure to satisfy. 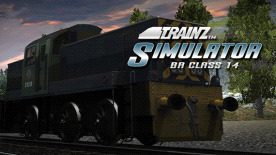 Trainz Simulator 2012 is required to play this DLC.